All that was to lead us to this theme that we find in some parts of the Bible…stories that involve fish. 2 weeks ago we talked about Jesus calling Fishermen as his first Disciples. In the fall we’ll hit the biggest of all Fish Stories…Jonah. Today we jump into a story that, to be honest, the fish take such a small part of, but that’s the point of today’s text. It’s not about how much of the story you’re in, but that you’re in the right story. It’s not about how much you have to offer, but that you offer what you have. It’s not about the size of the your gift, but the willingness to give it, to use it, to share it, to see what God will do with the little that you have. You’ll find today’s story in all 4 gospels. There are a few differences, as the gospels often offer, but otherwise basically the same. In Matthew’s version, it’s bookended with a story about John the Baptist’s death, and Jesus walking on water. One about grief, one about faith, and in the middle, one about Jesus doing what Jesus does with the little we have to offer. It’s in Matthew 14:13-21, where we read about Jesus feeding 5000+ people. Why? Simply the sheer number of people affected, and the craziness of the story. Let’s get into it and see why there’s more to this story than a crowd, a big dinner, and enough leftovers to feed an army. 13 When Jesus heard what had happened, he withdrew by boat privately to a solitary place. Hearing of this, the crowds followed him on foot from the towns. In the verses just before, we find a gruesome story. John the Baptist, Jesus’ cousin, was beheaded. All this because the King’s daughter asked for his head on a platter, and the King obliges. So sad. So when Matthew says, ‘Jesus heard what had happened.’ That is what happened. And what was Jesus’ reaction? To be alone. When were you last really sad? Death of a loved one, a break up, you didn’t get the job you wanted and thought you’d be getting, etc. In moments like these, you might wanna hide. You cancel your plans, you say no to your friend’s invites, and you stay home, or go to your favourite ‘alone’ spot. Jesus didn’t have Netflix to binge on, so solitude actually meant solitude. Jesus is no different. That is his plan. To be alone. But that plan doesn’t transpire. 14 When Jesus landed and saw a large crowd, he had compassion on them and healed their sick. You get to your favourite spot and you see someone you know (bad timing). The crowd beats Jesus to his ‘alone’ spot. Not only is he interrupted, but they even get there before him. The only thing that could’ve changed his plans? COMPASSION. It always wins at the end of day. Compassion isn’t just feeling bad for someone, it’s feeling what they feel. It’s like you are suffering what they are suffering…you are suffering with them. It’s more than ‘too bad’…it’s more like…I see your pain, I feel your pain, how can I alleviate your pain. I love this scene. The Disciples are thinking, ‘good job Jesus, but let’s get these people out of here, it’s getting close to dinner.’ Smart. They propose an idea to Jesus. Jesus, of course, says, I take your idea, and I’m going to expand it. Jesus takes good ideas and turns them into great ideas…or crazy ideas, depending how you look at them. Probably more like crazy ideas that turn into great ideas. Words many of us have said before…WE ONLY HAVE…or…I DON’T HAVE enough. These are regular, everyday, human reactions. Here’s where the fish come into play. Told you… they are a very small part of this story. Only two of them. That’s it. Two fish. What part do you play? Do you see yourself as insignificant? Or can you appreciate the role that you play, the part that you contribute? We think this about ourselves too often. 18 “Bring them here to me,” he said. What do you have? OK. Offer it up. Give it to me. Hand them over. I’ll work with what you have. Those are Jesus’ words to the Disciples and to us. JUST? You don’t ‘just’ have 5 loaves. You don’t ‘just’ have 2 fish. You HAVE 5 loaves and 2 fish. BRING ME WHAT YOU HAVE. Jesus takes ideas, loaves and fishes, money, a sense of humour, time, energy, talents, love, artistic gifts, skill with words, quickness of eye or fingers, whatever we have to offer. He holds them before his Father with prayer and blessing. Then, breaking them, so they are ready for use, he gives them back to us, to give to those who need them. 19 And he directed the people to sit down on the grass. Taking the five loaves and the two fish and looking up to heaven, he gave thanks and broke the loaves. Then he gave them to the disciples, and the disciples gave them to the people. This is interesting…Jesus takes the food, prays for it, breaks the bread, and gives it back to his Disciples. Jesus will always turn back to us and say, ‘you in?’ Let’s do this together. So instead of worrying about what you don’t have, Jesus reminds us to thank God for what we do have, and then use it. 20 They all ate and were satisfied, and the disciples picked up twelve basketfuls of broken pieces that were left over. 21 The number of those who ate was about five thousand men, besides women and children. Will we be like Jesus and let compassion influence our actions & reactions? Jesus eventually does get some rest and alone time, we should too. But if we choose to be people of compassion, sometimes the rest will have to wait, but the possibility for a miracle goes way up. Simply put, compassion may take over, and if it does, follow it to see what happens. Will we let Jesus take our good ideas and turn them into great ideas? Brainstorming in team settings is always the best way to arrived a preferred outcome, the same goes with Jesus. Don’t be afraid to offer up an idea, and don’t be sad when a better one comes along. Jesus’ ideas might even be crazy, but they are definitely worth entertaining if they come from him. Will we let Jesus use our limited resources and turn them into miracles? Only in John’s gospel do we read about a boy in this story. He gave what he had, his lunch that contained only 5 loaves and 2 fish. And guess what? Jesus did what only he could do, and turned it into a feast. A lunch combo into a FEAST. Crazy? Yes. Amazing? YES. Is there a pass time or a passion that your friends are into that just baffles you? You think, ‘how can anyone spend time doing this?’ I’d rather watch a tap drip than doing that? Fishing might be that thing for me. Some of my friends absolutely love it. I don’t see what’s so awesome about it. I have a friend who uses his kayak to fish; I mean, who would ruin a good paddle by bringing a fishing rod along? I have very limited experience in it. Never on a boat – only on a shore. I’ve never once thought,“I would love to go fishing this weekend”. To be fair, it’s not something my dad ever introduced to me or anyone in my family was into. You ever talk to people who love fishing? They are serious. There are those who do it for a hobby, and then those who do it for a living. We’d call them the real Fishermen or Fisherwomen. Well, if you’re wondering why we’ve started with this little rant, it’s because it’s to these kinds of people that Jesus extended an invitation (one of his initial invitations) to follow him. Jesus’ first disciples were fishermen. They either loved fishing or knew no better way to make a living. Today’s story lets us in on Jesus’ attraction of first century crowds, Peter’s acknowledgment that Jesus is Lord, and our response to Jesus’ invitation – to fish? No, to do what he asks and what he calls us to. Just before this story, in Luke 4, we read about Jesus’ being tested in the wilderness, we get a glimpse into Jesus personal mission statement (proclaim good news, set oppressed people free, give sight to the blind), and other acts of healing and deliverance. When we reach Luke 5, we find Jesus teaching, with a crowd gathering. So much of a crowd that he had to find a creative way to have this crowd actually hear what he is saying. Luke makes an important point in these opening verses: When Jesus opens his mouth, he is speaking the words of God. Very intentional here by Luke – he wants us to know that Jesus’ words are God’s words. Why did the crowds form? Why were people so intrigued? What was all the fuss about this guy Jesus? It was this: His words were God’s words, his teaching was God’s word, to them, to us, to anyone who hears them. This is all we know about what Jesus taught that day, no details, just this phrase, “The people were listening to the word of God”. At a certain point, Jesus asks Simon to push his boat out to shore. This is not ideal for Simon, who just finished his shift. Who wants to drag out their tools when they’re done work? Not too many people. Especially those who’s work is hard and labour intensive. Was this a reluctant yes? Was it a willing yes? Was it a, ‘sure, but do you think you know how to fish better than I do,’ yes? Note that more fish were caught at night in this sea. The day time wasn’t a good time to catch anything. Again, adding to the potential questions from Simon and the others. What does that response look like for you right now? When was the last time you responded to Jesus this way? Might you be in a conversation like this with God right now? 6 When they had done so, they caught such a large number of fish that their nets began to break. 7 So they signalled their partners in the other boat to come and help them, and they came and filled both boats so full that they began to sink. Do you regularly allow God to help you at work? Are you open to Jesus’ informing your work related decisions and tasks? Do you even consider that this is possible? Peter’s response is key to this story: it’s one of awe, worship, humility, brokenness, awareness of sin. Peter didn’t say, ‘C’mon Jesus, now you’re just showing off’ He says, You’re God, I’m not & I’m in! Miracles aren’t about Jesus’ showing off – Miracles help us see God for who he is, and see ourselves for who we are. We see this line 9 times in the gospels from Jesus. Don’t be Afraid. About what? Afraid about what just happened? Afraid about what is going to happen? Both? Jesus knows that what he’s calling them to is risky and scary and different…but it’s also worth it. He doesn’t want fear to hold them back. He never wants fear to hold us back. Think about how crazy this is: after their best day on the job, Jesus’ asks them to do something else. I mean, at least he asks them to fish for something else. But after the most successful and profitable day on the job, he turns to them and says, ‘It’s time to quit.’ That’s crazy right? I’d be like, Are you sure Jesus? We had a good day. We can made bank with you on our team. Hey guys, can we all vote to invite Jesus as our new business partner? What percentage do you think he’s worth? 10, 20? 50%? It would turn into an episode of Shark tank. Their response is wild and crazy and yet, still appropriate. They pulled up their boats on shore, left everything and followed him. WOW! In essence they say, I’ll keep fishing…but it’ll be for things that matter. Disclaimer: Not everyone has to leave their job. Some do (many examples of that, my Dad being one of them). But most don’t. At the very least, what will change is your purpose. See things for more than they are. Invite Jesus to help you at work, but know that it’s also not all about what you do or accomplish, and more about the people you impact, the neighbour you love, the co-worker you listen to, the child you teach, the boss you pray for. Getting a HUGE catch at work is great. Landing a HUGE sale at work is great. Making lots of profit at work is good. BUT…seeing God work in someone’s life, seeing Jesus’ ways get planted into someone’s life and then seeing that life make a difference because of it, that’s HUGE. That’s the HUGE catch Jesus is calling us to. What is your YES to Jesus about? What does your “If you say so, I’ll do it” story look like? Who is Jesus drawing your attention to…or putting a burden on your heart for…basically, who does Jesus want you to lure into the Kingdom of God? Is saying YES scary? Yup. Is it worth it? Yup. When Jesus extends an invitation to normal people like us, let’s try and get ourselves to this response, “Because you say so…I will”. The Table is the most important piece of furniture in the Kingdom of God. Let me say that again…The Table is the most important piece of furniture in the Kingdom of God. It’s what brings us together. It’s what levels the playing field. It’s what gets us talking, and praying, and confessing, and asking questions. On Sundays like today, we have two tables set-up. One is larger in length, at the back, that holds the coffee and snacks for our break, the other is smaller in size, but larger in significance. Both do similar things, bring the body of Christ together in Community. We’ll get to more of that theme in today’s post, but first…a bit of a recap from our series: GROW-ing. Our winter series was intended for us to walk through few vision points, and we did just that. What did we focus on? What must I give up? What must I add? Formation isn’t a one time event, but a collection of moments, experiences, practices, conversations, gatherings, challenges, wins, losses, brokenness, and healing. What kind of dent or difference are we making for God and for good, at home, in our neighbourhood, at work, in our city, in our world? This ALL happens…in and through the context of community. We want to grow in our sense of community. The word for church is EKKLESIA. This comes from two words: Kaleo (called) & Ek (out). We’re called out of the world, to be community together. Henri Houwen talks about a traditional Bell Tower ringing…and people, from different homes, different experiences, different backgrounds, different influences, come together and become one in Christ – to be the church together. Remember though, that we’re also called back into the world, to be light, to be hope, to be makers of peace. The church is called out of the world to be community together (gather) and we are also called back into the world (scatter) to be live out the love of Jesus we’ve experienced together. Earlier in our gathering we read from two scripture texts. Matthew 18 & Acts 2. (Matthew 18) For where two or three gather in my name, there am I with them. (Acts 2) They devoted themselves to the apostles’ teaching and to fellowship, to the breaking of bread and to prayer. Everyone was filled with awe at the many wonders and signs performed by the apostles. All the believers were together and had everything in common.They sold property and possessions to give to anyone who had need. Every day they continued to meet together in the temple courts. They broke bread in their homes and ate together with glad and sincere hearts, praising God and enjoying the favour of all the people. And the Lord added to their number daily those who were being saved. Jesus’ words in Matthew were the initial invitation to gather around him. In Acts 2, Luke fleshes this out in a practical and real way. Here’s the beauty and mystery of all that we talked about in this series…it all happens or flows out of a biblical and healthy understanding of community. What we learn from early on, from Jesus words, from the early church’s experience, and up until our current day expression: Following Jesus can’t happen alone. It’s impossible. Think about the 2 sacraments that the protestant church practices: Baptism & Communion. You can’t dunk yourself. Baptism alone is just a bath. The word Sacrament = Mystery. And it is a mystery how broken people become family. It’s a mystery I want to be a part of. He’s saying that the weak need the strong, and the strong need the weak. Just like kid’s Lego sets, you don’t always know what’s missing, until you need a piece. So…know this…as we grow in community, we will inevitably grow in formation, generosity, and in impact. And know this too…gathering together is not to be taken lightly…it’s so important to your spiritual life. You are MISSED when you’re not here. The church is not the same, when you are not here. Let’s end with Paul’s words in Colossians 3:15-17. May they be a prayer for you, for us, for all who desire to find Christ in the context of community, the church. We’re continuing our conversation from last week about our desire to grow, as a community, and as individuals, in our impact. Growing…in Formation…in Generosity…in our sense of Community…will always lead to us making a greater impact! LIVE in such a way that convinces others that God is real and present. Fredrick Neichze, a philosopher and cultural critic, who lived in the mid-late 1800’s was an advocate of atheism and agnosticism. He was well known for one of his written pieces, Madman. About a man running in the streets shouting, God is dead, God is dead. One of the many lines was this very interesting one, “And you killed him, because you live like he doesn’t exist.” A serious critique of Christianity, wouldn’t you say. Ghandi, in less dramatic style, said this once to the church, “I like your Christ, I don’t like your Christians. Your Christians are so unlike Christ. If they were, all of India would want to be a follower of Christ.” Also, quite the critique, don’t you think? They were both saying the same thing: Live like Jesus, and people might just see that God is ALIVE. If you don’t, you Christians are hurting the cause. In 1 Thessalonians 1:6-9, Paul is grateful that this early and young church are, one, imitators the gospel (living out their faith for people to see) and two, loud with their lives (his words are in fact, and the message rang out from them). So, don’t just talk a good talk…live a life that backs it up! SERVE in such a way that shows others that Love & Grace are alive & well. Anytime we give, serve, contribute, fill a need, help a hurt, feed an empty stomach, … We are being Jesus to others. Jesus will only be as alive to others as he is alive in us and through us! SPEAK in such ways that communicate Jesus is alive and is worth following. I recently came across some info that says there’s a decline of religious and moral words. Words to describe faith have declined over the course of the 20th century. According to Google Ngram, 74% of words associated with faith were used less frequently over the last century. Words like, grace, mercy, wisdom, faith, honesty, righteousness. And…words like love, patience, gentleness, have become rarer too. Modesty = 52% less. Kindness = 56% less. Thankfulness = 49%. Why bring this up. Well, I believe that it’s our responsibility to provide language and words for good conversation to take place. When you do open your mouth to speak, remember that it’s a conversation, never a speech. If we wanna make an impact? If we wanna make a difference? It’ll happen in the way we LIVE, the way we SERVE, and in how we SPEAK. I guess now all we have to do is simply live out our faith…take advantage of the opportunities to serve…and when the moment arrives, speak, with gentleness, respect, grace, and a touch of salt. Who knows what God can do through us? Let’s try and see what happens. We also had the chance to interview Michelle Little this past Sunday. We do this from time to time at The Village; take a few moments to hear someone’s story through a live interview. Michelle is passionate about helping young people, kids and teens, discover how amazing it is to follow Jesus, and how that will help them in every area of their life. She’s also very excited to help them become future leaders. She sees camps like Mini Yo We as a partners in a child’s development, both spiritual and physical. We talked about her journey of formation, the people that helped her along the way, and how this inspires her to do the same for others. We heard about her patience in waiting for what she thought was her and God’s dream for her life. How she almost gave up on it. How it eventually felt like the exact perfect time for it all to come together. She affirmed our greatest church community value, that it takes a village for any of us to become who God is calling us to be. Why does she follow Jesus? Because he makes sense. Because he is worth every inch of our heart, and every moment of our attention. If you get a chance to chat with her, she’d love to tell you more. Why do we think that we have to be loud to say something…that we have to be loud to get the attention of others? My Grandfather used to say that if you throw pots down the stairs they’re loud and clanky, but that’s because they’re nothing inside. However, when you turn a light on, you hear nothing, but everything in the room changes – the light says so much with very little volume. We can say so much with who we are, how we live, how we love…and yes…even with what we say…and how we say it! 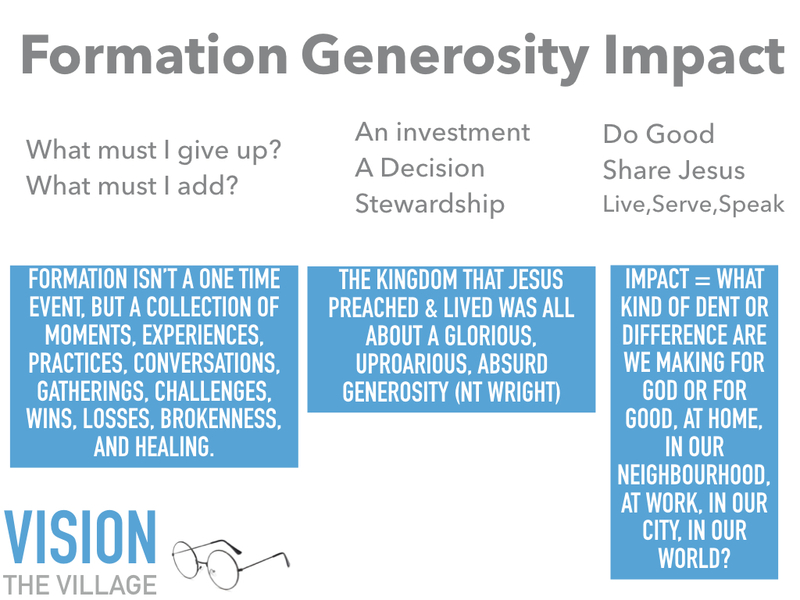 So far we’ve talked about Formation (so important) & Generosity (important and & fun). We’ll eventually end with Community. But today we land on IMPACT. Can a church, be a church, without the expectation of growth & impact? Can we say we’re a church, but then have no expectation or desire to increase, both in number and in impact? I’m pretty sure the answer is no. And what does or should that even look like? You can’t hear it without it changing you, without it making an impact on you. It’s not a song that can stay on your personal playlist…you gotta share it. What does it mean to make an impact in our world, our society, our cities, our neighbourhood? Making an impact must involve pointing people to Jesus. If we believe that Jesus points us to God, then we must, in some way, point people to Jesus. And be as creative in doing that as possible. I’ve always found that 1 Peter 3:13-17, gets us to the heart of what it means to live an impactful life. Who is going to harm you if you are eager to do good? But even if you should suffer for what is right, you are blessed. “Do not fear their threats; do not be frightened.” But in your hearts revere Christ as Lord. Always be prepared to give an answer to everyone who asks you to give the reason for the hope that you have. But do this with gentleness and respect, keeping a clear conscience, so that those who speak maliciously against your good behaviour in Christ may be ashamed of their slander. For it is better, if it is God’s will, to suffer for doing good than for doing evil. Peter gives us a really healthy template for what an impactful life looks like. More than that, how to share our faith with integrity and authenticity. I have a contact card…are contact cards still a thing?…oh well. There’s a line on it that I’ve borrowed and paraphrased from Galatians 6:9. It goes like this. Don’t stop doing good things. Doing good will always be part of our mission. On days when it’s easy. And on days when it’s hard. Christ followers have an incredible contribution to make to society in which they live, by breaking the cycle of people returning evil for evil. You can’t go wrong with doing good – it’s like planting seeds and believing for a good return – it’s also like laying the groundwork for God to get people’s attention. In your hearts = at your core, in your centre. Simply saying, keep JESUS at the CENTRE. Also means you’re acknowledging Jesus as HOLY = he’s God, I’m not. If I want my witness to be effective? If I want my life to make a difference? If we want our church community to make an impact? The word for answer is the word ‘apologia’ which we translate as apologetics = defence, reason, response, rationale. Be ready. Be prepared. To answer or engage in dialogue. But more important than that is, live a life that begs the question. Where will the questions rise from? Here’s the thing: It’s impossible to have Jesus in you, without some of him leaking out of you.  Be gentle, respectful, and authentic. Peter ends so beautifully. He reminds us that how we share faith is as important as sharing our faith. With gentleness. With respect. With authenticity. If you only want to be right or theologically correct, then that’s all you’ll be. But always remember that your love, your grace, your posture of humility, will speak louder than any words you use in your conversations about faith. Basic principal to remember: share the gospel with the spirit of Jesus. Lovingly meet people where they’re at. Who are you being attentive to? – Do you listen more than you talk? – 82% of people say they’d go to church if they were invited. 2% of Christians invite their friends to church. A little bit of a disconnect there! Are you/we making our church community a safer, warmer, more grace-filled, excellent, and intriguing place? – People will inevitably belong, before they believe. Let’s always be making it easier for our friends and neighbours to belong, and let the Holy Spirit encourage them to believe. When you have nothing to talk about, you talk about? THE WEATHER. When you have something to talk about, we still talk about? THE WEATHER. The weather is the easiest thing to talk about? Why? What’s not so easy to talk about? MONEY! You may have heard this before – that some married couples will never talk about Religion, Politics, and…MONEY. They vow that it helps their marriage! Those three things have caused many arguments, but the weather, that’s a safe topic. Out of the three, money is by far the most divisive. It has broken up many relationships. If I were to ask, does money make you happy? you’d probably say, no. If I were to also ask, would a little more money make you a little happier? you may say, YES! We’ve been talking about and will continue to talk about Spiritual Formation, Generosity, Impact and Community. 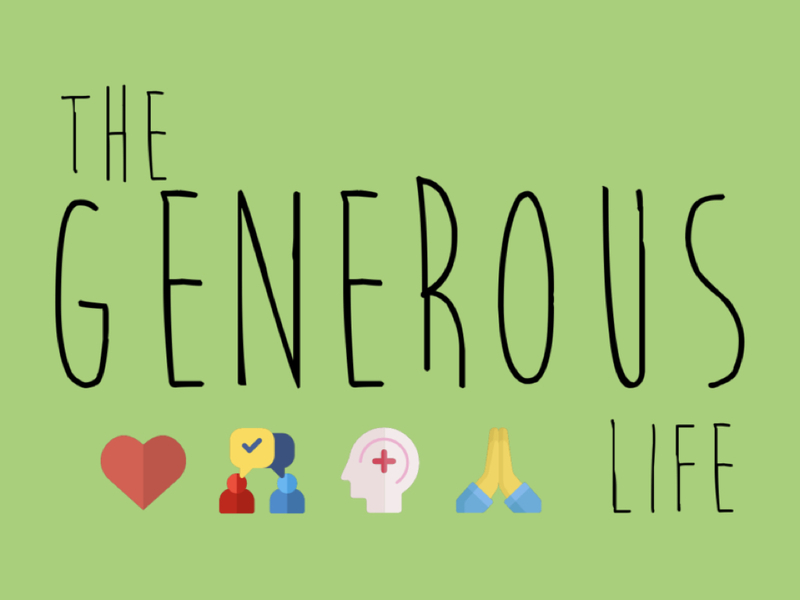 Today we continue with GENEROSITY, but will move into some practical thoughts on giving and stewardship. It’s about investing, not losing. We said that this week we’d get into the nitty gritty of it. Well here we go. Why even talk about this? Why talk about money? 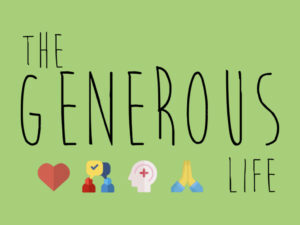 Generosity is a theme through out scripture. You can’t miss it. If you do, you’re reading with blinders on. Money, gifts, possessions, time – it’s all there. God gives – God calls us to give. God loves – God compels us to love. The bible talks about money a lot. Directly 800 times, indirectly, more than 2000 times. That’s a lot. More than 1/3 of Jesus’ parables include references on money or possessions. Because what we own, make, spend, keep, and owe, is connected to a deeper place – our heart. Jesus says (Matthew 6) You can’t serve both God & Money. Mammon, the word for money in this text, refers to property and wealth as a god…as an idol. It was a Chaldeon word for both god & money. Jesus’ point is clear: don’t turn money into what it was never supposed to be, a god, an idol. We joke about the term, “almighty dollar”, but we are well aware of it’s power. Jesus is warning us to be careful not to let money give you orders or boss you around. Who has ever felt like a slave to money? Either by choice or by circumstance? 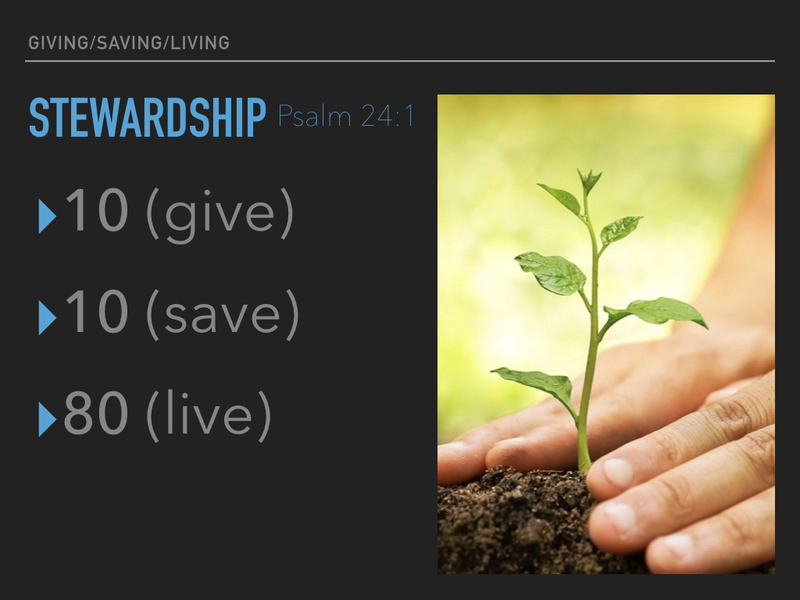 This is why stewardship is so important – using wisely, what’s been given to you. Using what you have – your time, gifts, skills, land, opportunity, and MONEY, well. The reason we even use the word ‘steward’ is because we have come to the understanding that everything we have comes from God, and in light of that, we ‘steward’ the gifts of money, time, and opportunity, that we have been given to us. As people who are discovering what it means to follow Jesus, this is the worldview we start from. This is the lens by which we see the world. If this is true…that what we have has been given to us, then we are responsible to ‘steward’ it well. Here’s the best way I know how to steward finances: 80-10-10. This works! Many Studies, Psychologists, Financial planners, all agree that this works. People without faith in Jesus have even come to know that this works. Live on 80%, Save 10%, Give away 10%. It’s good math. It’s good human ethics. By giving first, I invite God back into the equation. By giving first, I remove the chance for selfishness to creep in. By giving first, I’m grateful for what God gives me. By giving first, I’m living with open hands instead of tight fists. So you’ve figured that part out. Which means you’ll probably ask this next question, How much do I give? YES, 10% is either a great place to start or a great place to strive for. It works – it’s good – but it is an OT law. Do you follow every other OT law? Hmmm. Think about it. Pray about it. Be strategic and thoughtful about it. Which means your giving might be even end up being more, depending how God is challenging and directing you. Here’s the thing, I really think that giving 10% to the local church is an act of trust, of worship, of gratefulness, of community. And I also believe that if you do this, you will continue to experience God’s provision, and will continue to see all you have as God’s gift to you. BUT…if you’ve never done this; if you’ve never given 10% of your income away (at the beginning of your budget), I want to encourage you to start somewhere, and see what God does, in and through you. If you’re at 0%, start at 3%. If you’re at 2%, try 5%. If you’re used to giving, but aren’t so consistent with it, commit to 10% at the top. It’s amazing what God will do. Andy Stanley offers a two-fold approach: form a basic plan with a willingness to consider spontaneity when opportunities arises! Canadians save less today than 10 years ago. 0.8%, down from 1.4% (this will eventually effect consumer spending and economic growth). People spend almost $5000 a year in impulse purchases – that’s almost a full TFSA limit. Seth Godin Talks about the $37000 latte. I’m not telling you not to buy coffee, but if you’re buying coffee and not saving, something’s wrong. If you’re buying stuff before you save, that’s not right. If you’re wasting money without knowing where it’s going, and not saving for your future, it’s simply unwise. Take a lesson from the ants, you lazybones. There are lots of ways to save. Just like giving, you have to be strategic and decisive about it. I LIVE…on the rest, as a mature & responsible neighbour, friend, parent, and human. One pretends to be rich, but has nothing. One pretends to be poor, but has great wealth. Funny thing is that the verses that follow are about stewardship & generosity. Stewarding God’s resources takes planning & training. It’s takes some work. Why not try talking about the 90%? We (rightfully and sincerely) encourage conversation about the 10% of giving off the top. However, if we’d be wise and intentional about the rest, the 90%, we’d have no problem giving away the 10%. Many are unable to be generous because they have yet to develop a sustainable plan for what we decide to keep. Simply put: Live below your means. You have 3 choices: above, within, below. Which one do you think is best? All 3 of these…honour God. – Make a budget and when doing so, put giving at the top, before any other expense. – Start with something. If 10% sounds crazy, start with something smaller for now. – Pray about this. Ask God what he thinks you should give. We ask God for all sorts of stuff. We ask God for wisdom in all areas of our life. He is faithful to lead and direct you in the process with gentleness. – Create a rhythm and routine. Give weekly or monthly or every time you get paid. Make it a first thing, not a last thing. Use our Canada Helps partner to make it easier. Or use an envelop system if you like to give cash or cheque. This helps you to be committed to what you’ve decided to give. – Be open to God’s voice in your life. Be open to opportunities to help, to serve, to give. In the end, as much as your giving is helping (the local church, a charity, a neighbourhood need, etc) others, your giving is actually helping you to become the person God is shaping you to be. – Those who don’t save are saying that they don’t care about their future. – Those who don’t save are thinking selfishly about today, without any thought for tomorrow. – Yes, there are seasons where saving might feel impossible or is impossible, but don’t let that be the norm. – When you get a deal on something, save the difference. – When you finish paying something off (car, furniture, loan), keep saving some or all of that money. – If you’re buying $5 coffees, but aren’t saving, that is not good. Buy cheaper coffee and save the difference. That goes for any small luxury. – It’s not that you shouldn’t enjoy going out or vacationing or nice things. Please do. But, if you’re spending money on those things and not saving, then you’re doing it wrong. Save first, use what you have left to spend & enjoy. – All we will say here is this: create a budget, and stick to it. It’s amazing what we can live on when we create healthy parameters to live within.